Hey everyone! some great deals this weekend! 50% off all seasonal toppers (even from past years)! Have a great Thanksgiving week/weekend everyone! New for Collabor88 november 2018 we have something a little more special. This months release is a special limited edition home just for November 2018. Only 888 copies will be sold, and you can get yours at the introductory price of $888 at collabor88 this month only! 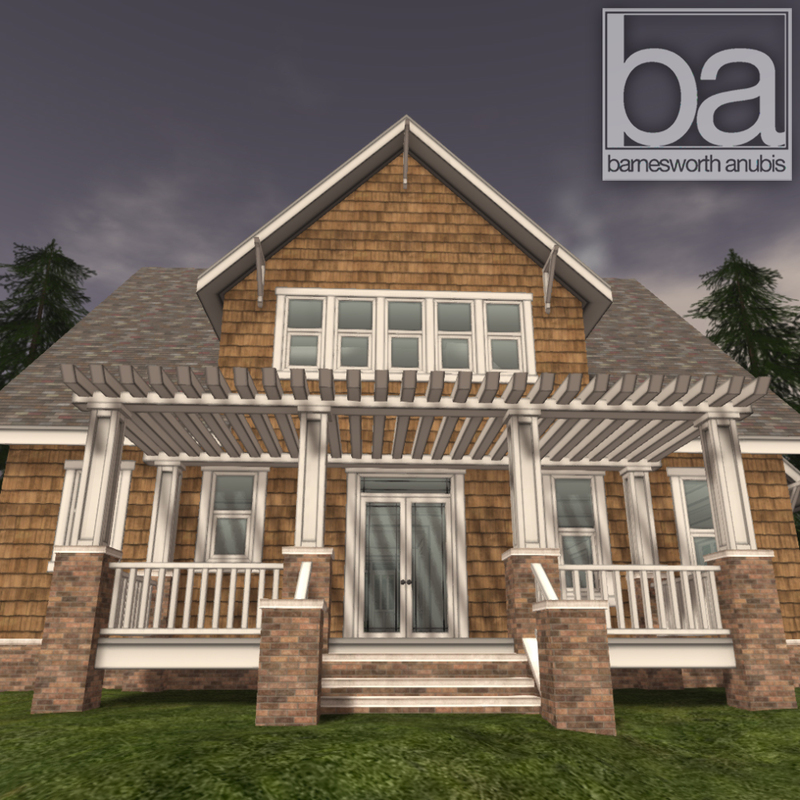 The [ba] shelburne home is a classic home perfect for the upcoming holiday season. 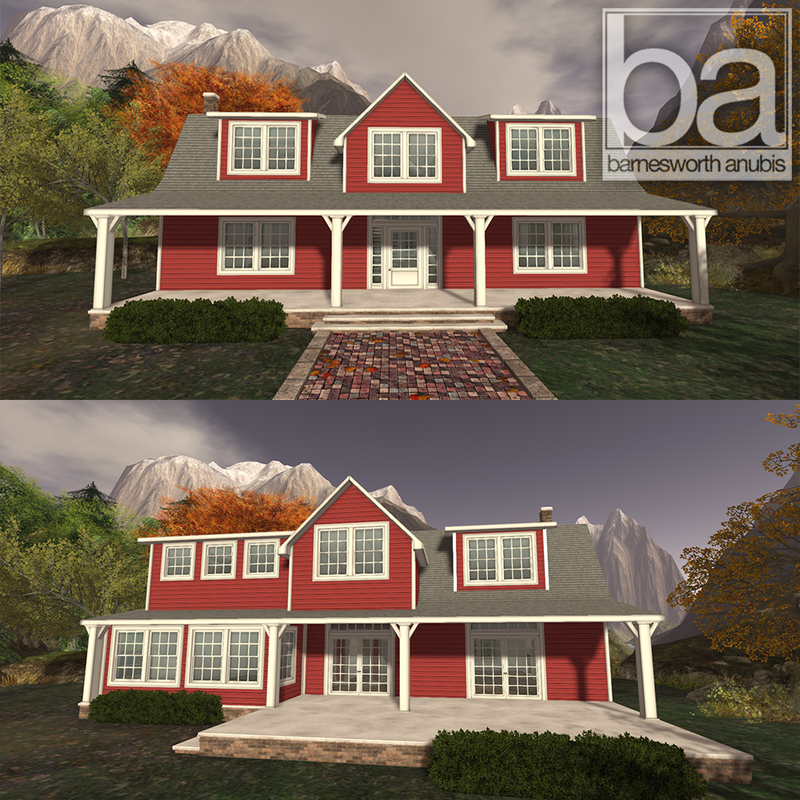 A charming gambrel style roof and crisp red and white exterior give a country-side barn appearance that will transition well through all seasons. The exterior boats a covered front and back porch. The interior is spacious and flowing. 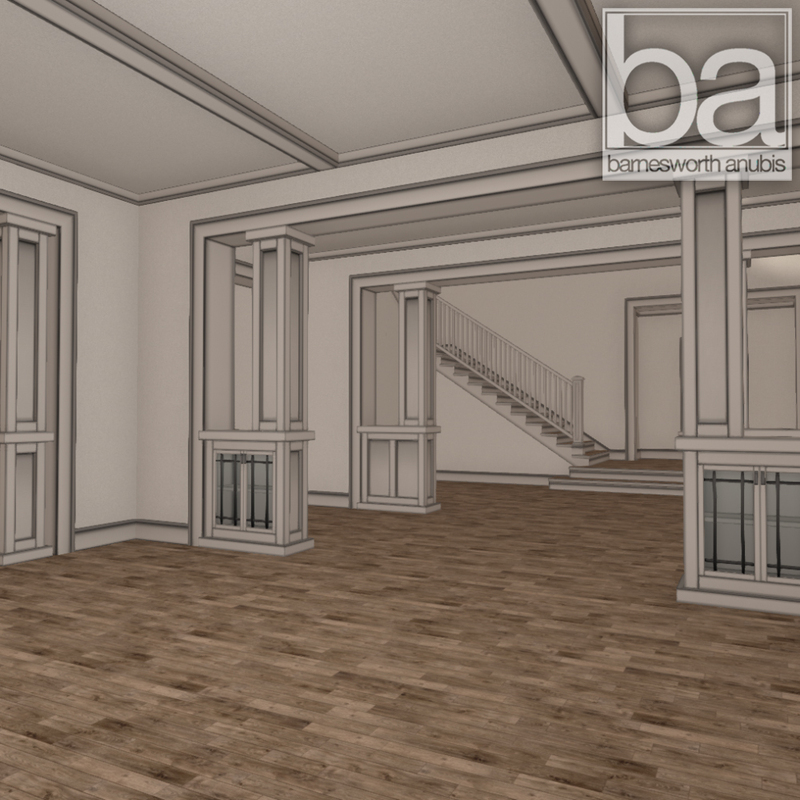 A grand two story central foyer leads to a formal dining, two living spaces, and a mud room. There is a large spacious room perfect for a kitchen and an attached sun room. Upstairs is two bedrooms, including a spacious and well appointed master bedroom with fireplace and built in shelves for cozy feel. There is also a luxurious and spacious bathroom on the top floor. The house comes in at 138 prim impact (mesh), and a 26x30 meter footprint. Like most of my other structures it is easy to customize walls, floors, trims etc inside and outside with tinting or using your own textures! 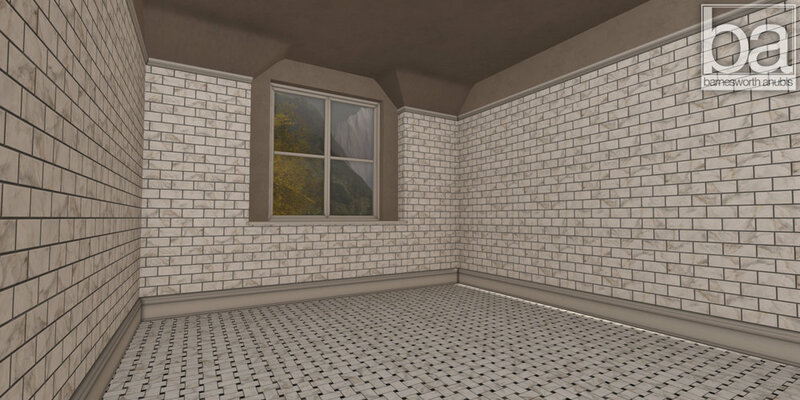 For extra ease, I have included the textures for the house plus a few wall color choices. 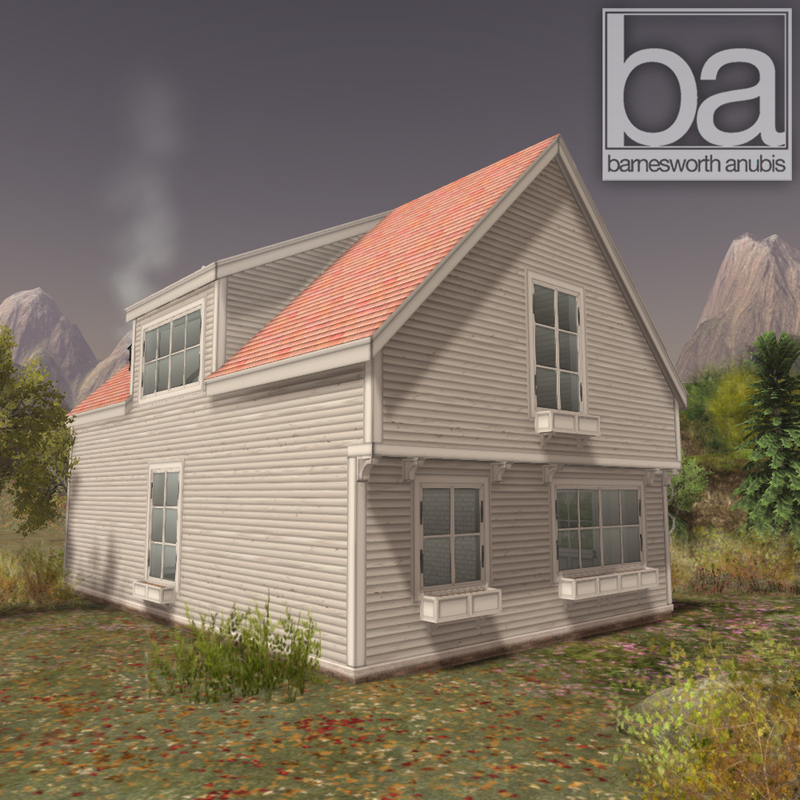 The [ba] shelburne home house will be available at the Collabor88 main store through Dec 6th 2018 at the price of $L 888. After Dec 6th it will be in the main store and on the marketplace at full price. Only 888 copies of the home will be sold, so be sure to secure your copy now! There is also an optional snow topper for the home available for the holiday season. Also be sure to check out the official Collabor88 dec 2018 Catalog with amazing creations by many other designers! New for Collabor88 may 2018 we have the [ba] napeague house! 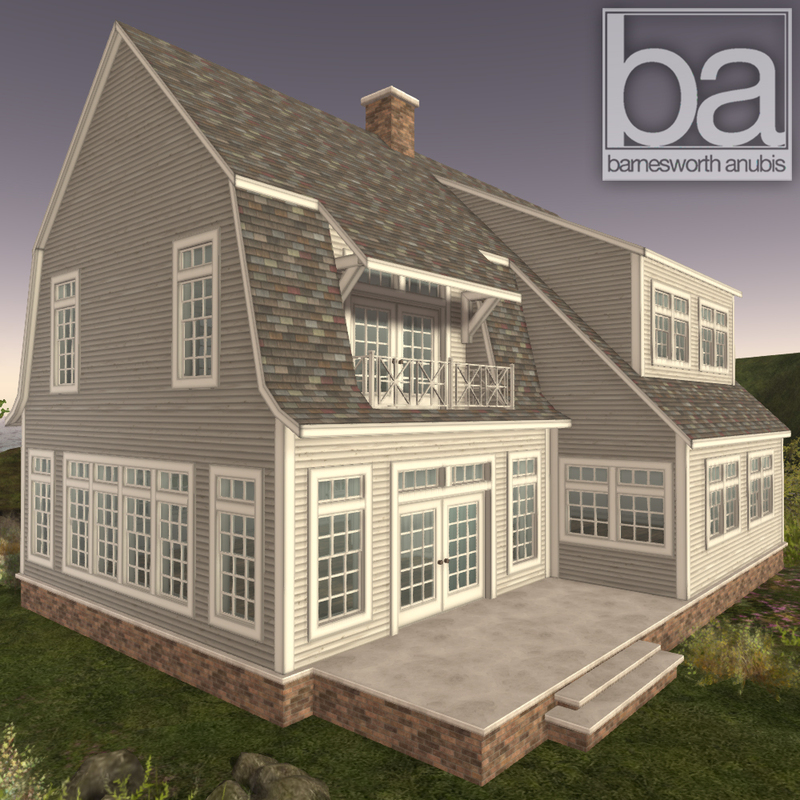 A charming gambrel style roof gives the napeague home classic east coast styling. Perfect for a sandy beach, this spacious home has a flowing open layout with plenty of room for everything. The upstairs features a beautiful master suite with a balcony and fireplace. Scripted features include an easy to use central control for access, windows (privacy tinting and open/close), doors, and built in working fireplaces and chimney. The house comes in at 137 prim impact (mesh), and a 28x24 meter footprint. Like most of my other structures it is easy to customize walls, floors, trims etc inside and outside with tinting or using your own textures! The [ba] napeague house will be available at the Collabor88 main store through July 6th 2018 at a special reduced cost. After june 6th it will be in the main store and on the marketplace at full price. Also be sure to check out the official Collabor88 june 2018 Catalog with amazing creations by many other designers! New for Collabor88 may 2018 we have the [ba] smogen cottage! This home is the perfect marriage between cottage and loft living. Between the vaulted ceilings, exposed beams, generous windows, cozy wood stove, built in nooks, unique doors, window boxes, and industrial touches you get both cozy and sleek Scandinavian styling. The floor plan is very open with just the amount of privacy you need. The home has plenty of room for a kitchen, dining, living room, lofted bedroom, and a private bathroom. Scripted features include an easy to use central control for access, windows (privacy tinting and open/close), doors, and built in working woodstove and chimney. The house comes in at 62 prim impact (mesh), and a 14x20 meter footprint. The [ba] smogen cottage will be available at the Collabor88 main store through june 6th 2018 at a special reduced cost. After june 6th it will be in the main store and on the marketplace at full price. Also be sure to check out the official Collabor88 may 2017 Catalog with amazing creations by many other designers! New for Collabor88 April 2018 we have the [ba] hallstead farmhouse! A simple but classic home, ready for your own touches! The hallstead farmhouse has a spacious and open ground floor but plenty of defined spaces for all your needs. The home also features a some built in details such as fireplace, china hutches, and mud room lockers. Upstairs are two private rooms, great for a bed/bath combo! The home also features a very generous wrap around porch. 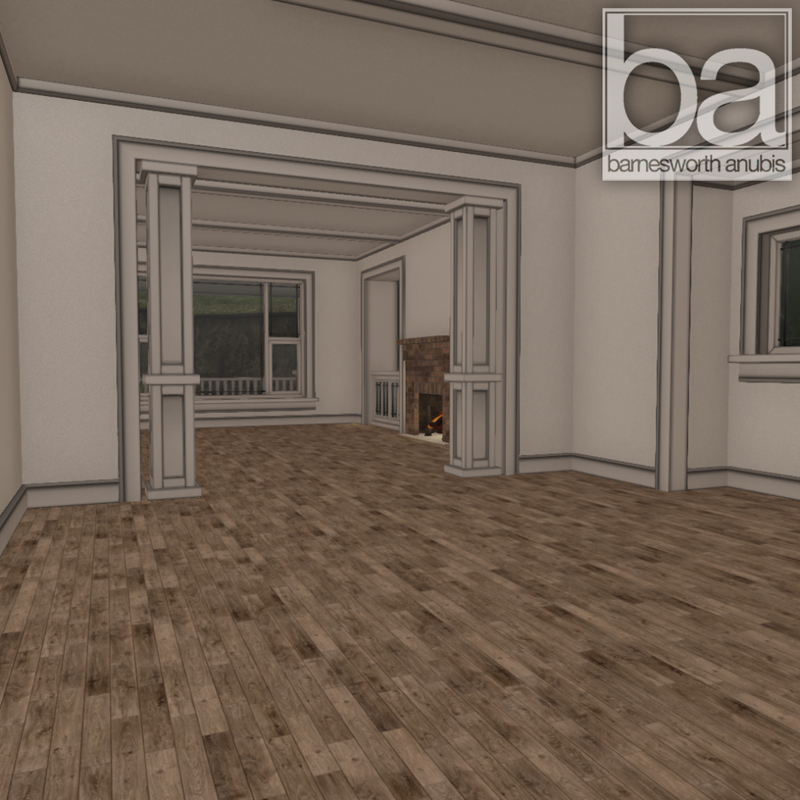 Scripted features include an easy to use central control for access, windows (privacy tinting and open/close), doors, and built in working fireplaces and chimneys. The house comes in at 127 prim impact (mesh), and a 26x27 meter footprint. 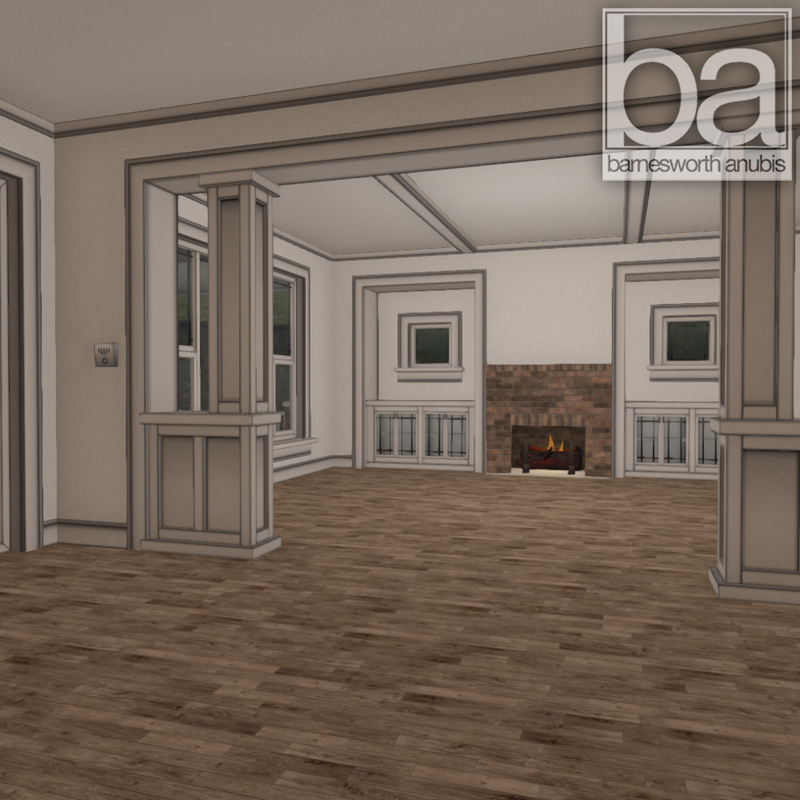 The [ba] hallstead farmhouse will be available at the Collabor88 main store through may 6th 2018 at a special reduced cost. After may 6th it will be in the main store and on the marketplace at full price. Also be sure to check out the official Collabor88 april 2017 Catalog with amazing creations by many other designers! New for Collabor88 December 2017 we have the [ba] hever manorhouse! Full of old-world charm, the hever manorhouse features classic tudor styling. The interior is finished with rich dark wood and cozy spaces. The home has a deceptive amount of space inside. There is a large kitchen with room for casual dining, a cozy conservatory/sunroom, a formal dining room with fireplace, a cozy living area with fireplace and built in bookcases, and a spacious and grand foyer and stairwell on the ground floor. The home also two cozy private rooms on the top floor with vaulted ceilings. The [ba] hever manorhouse will be available at the Collabor88 main store through january 6th 2018 at a special reduced cost. After january 6th it will be in the main store and on the marketplace at full price. Also be sure to check out the official Collabor88 december 2017 Catalog with amazing creations by many other designers! 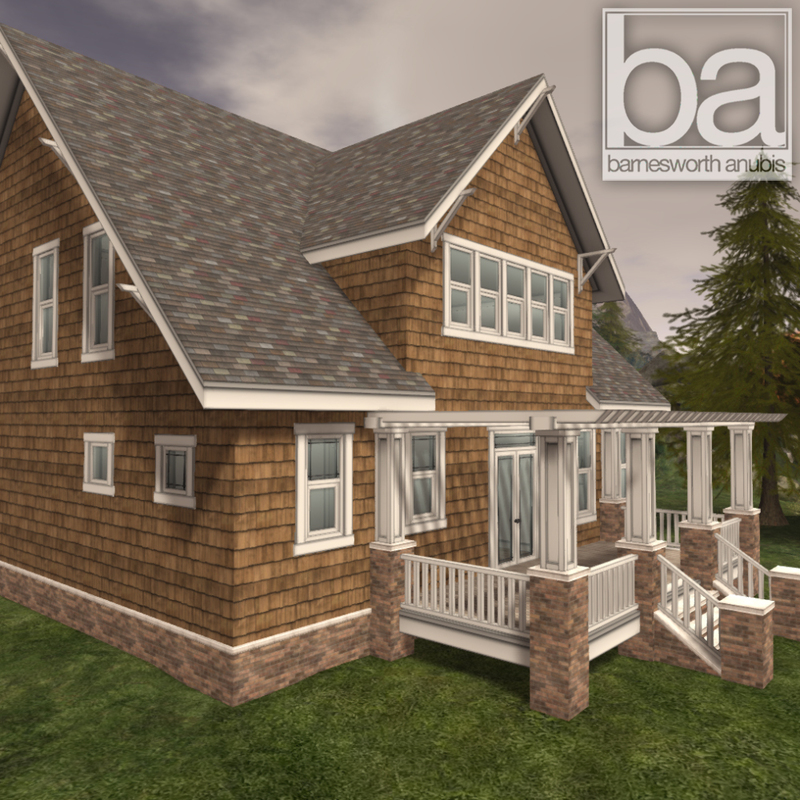 New for Collabor88 August 2017 we have the [ba] murray cottage! This spacious traditional style bungalow features a formal living room, dining room, kitchen, large sunroom and a bonus spacious stairwell/landing on the main floor. The second floor features two cozy bedrooms featuring vaulted ceilings and dormer windows and bathroom. Interior details include a working fireplace and charming built-ins. A generous sized front porch and beautiful french doors in the back off the sun room provide even more potential for outdoor living. The house comes in at 138 prim impact (mesh), and a 26x27 meter footprint. 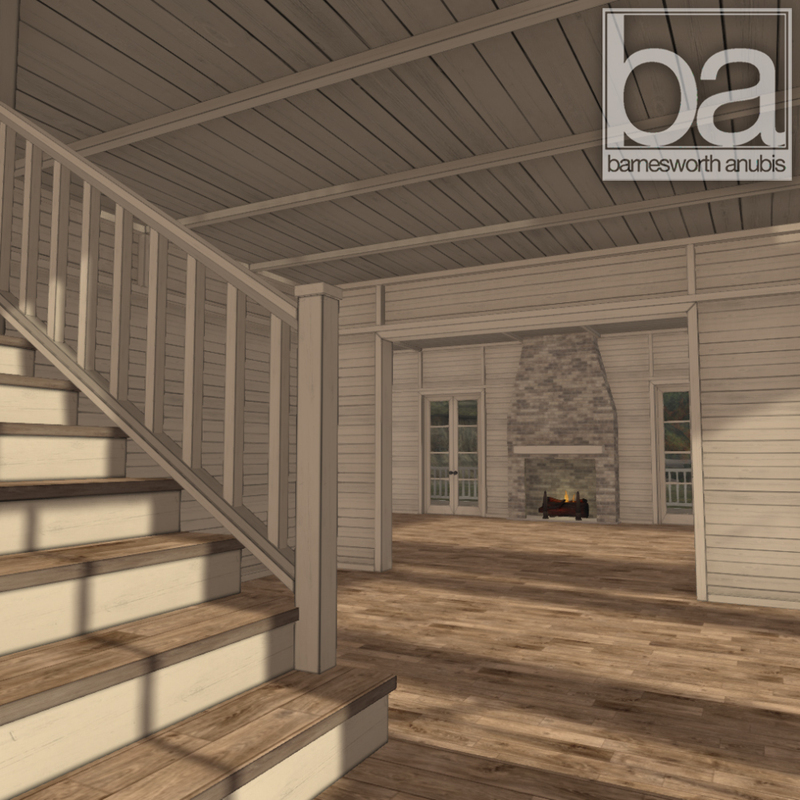 The [ba] murray cottage will be available at the Collabor88 main store through september 6th at a special reduced cost. After september 6th it will be in the main store and on the marketplace at full price. Also be sure to check out the official Collabor88 august 2017 Catalog with amazing creations by many other designers! New for Collabor88 july 2017 we have the [ba] monhegan tinyhouse! A small structure that lives large, the monhegan tinyhouse features an open floor plan with two distinct living areas and a loft space. Large french doors, airy floor to ceiling screened in porch, dormer windows, and open stairs make this little house feel spacious yet cozy at the same time. The home also features a small outdoor patio. Scripted features include an easy to use central control for access, windows (privacy tinting and open/close), doors, working wood stove and chimney. The house comes in at 45 prim impact (mesh), and a 18x11 meter footprint. The home comes with two slightly different scaled versions to accommodate larger and smaller avatars, and can also easily be scaled uniformly up or down more if needed. The [ba] monhegan tinyhouse will be available at the Collabor88 main store through august 6th at a special reduced cost. After august 6th it will be in the main store and on the marketplace at full price. Also be sure to check out the official Collabor88 july 2017 Catalog with amazing creations by many other designers! New for Collabor88 june 2017 we have the [ba] catalina bungalow! This cozy mission revival style home is ranch style with a single story. The home features one bedroom and one bathroom, as well as a formal living room, dining room, and kitchen. Interior details include a working firplace and charming built ins. Beautiful french doors lead this homes expansive outdoor spaces. The home includes a spacious front porch, a courtyard, and an outdoor living room with pergola roof and outdoor fireplace. The house comes in at 83 prim impact (mesh), and a 26x27 meter footprint. The [ba] catalina will be available at the Collabor88 main store through july 6th at a special reduced cost. After july 6th it will be in the main store and on the marketplace at full price. Also be sure to check out the official Collabor88 june 2017 Catalog with amazing creations by many other designers! New for Collabor88 may 2017 we have the [ba] malibu beach house! This clean and modern home has just the right amount of detail and warmth to create a soothing home. Perfect for any beach or any lot with a view. The home features a simple open layout with some surprisingly intimate and cozy spaces. The home has a spacious but minimal front porch leading to a living space with full glass windows to take in the views. Charming built ins and fireplace add some character to the main floor. The main floor also features a closed off room for whatever your needs. 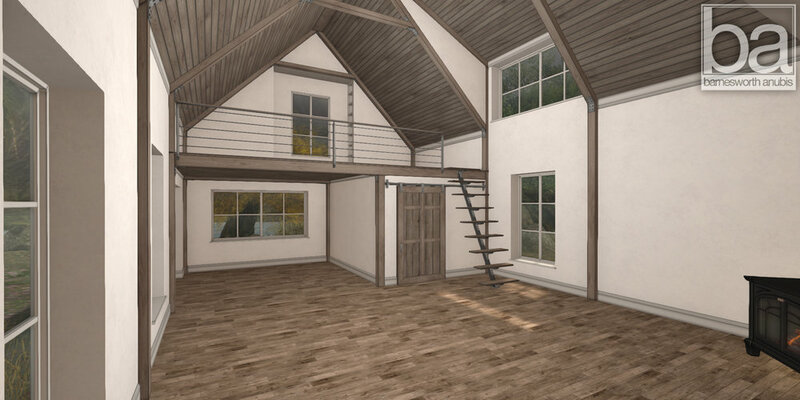 Upstairs is an open but loft with more fantastic windows perfect for a bedroom. Scripted features include an easy to use central control for access, windows (privacy tinting and open/close), doors, and built in working fireplace and chimney. The house comes in at 83 prim impact (mesh), and a 20x24 meter footprint. 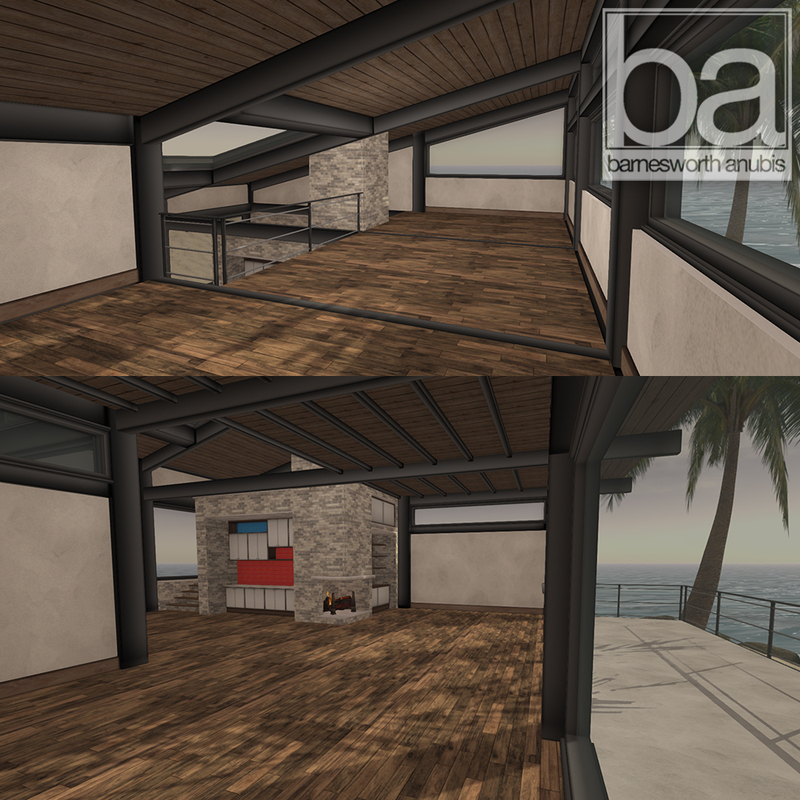 The [ba] malibu beach house will be available at the Collabor88 main store through june 6th at a special reduced cost. After june 6th it will be in the main store and on the marketplace at full price. New for Collabor88 april 2017 we have the [ba] camden cottage! This cozy little cottage makes a perfect little home. The cottage features a simple layout with a spacious ground floor and a cozy loft. The home has a rustic and cozy interior with exposed beams and white washed boards. The house comes in at 81 prim impact (mesh), and a 18x25 meter footprint. 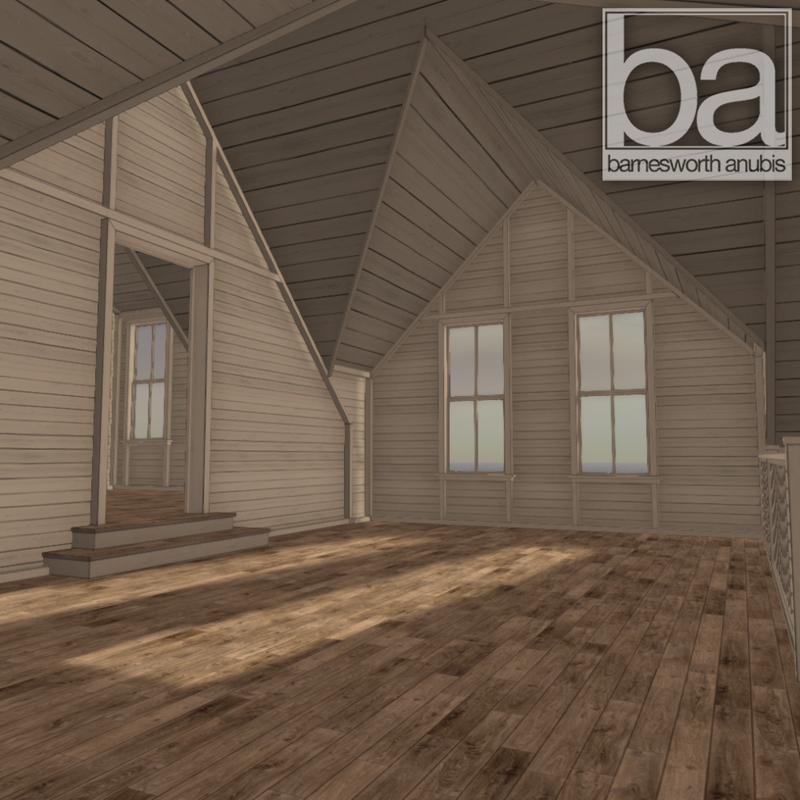 The [ba] camden cottage will be available at the Collabor88 main store through may 6th at a special reduced cost. After May 6th it will be in the main store and on the marketplace at full price. 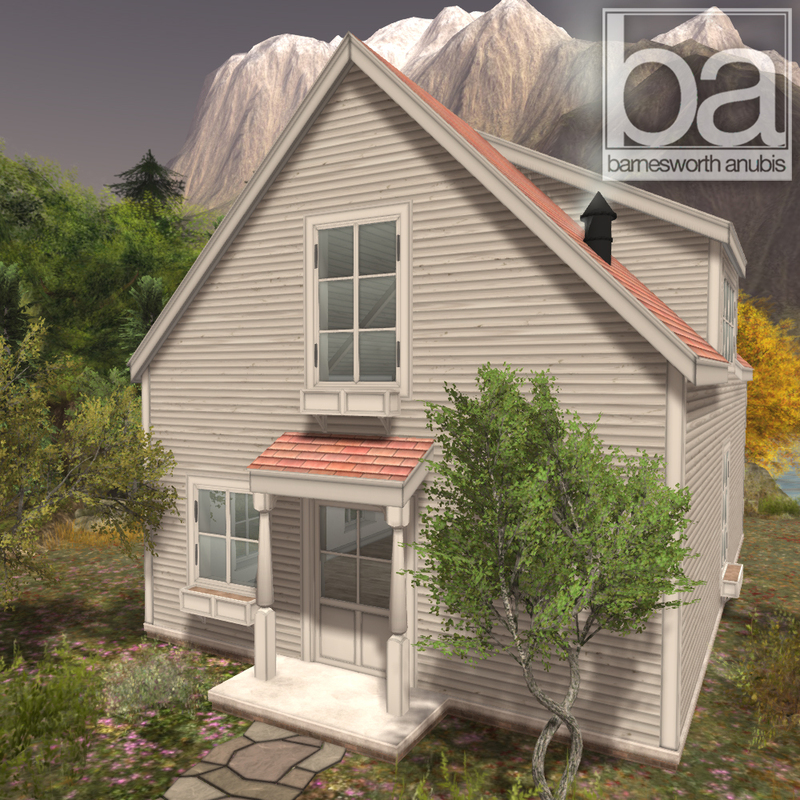 New for Collabor88 march 2017 we have the [ba] bannock cottage! This is a very spacious one or two bedroom layout cottage. The home features all the spaces you want in a home; gigantic living room with vaulted ceilings, formal and casual dining areas, kitchen, and a covered and uncovered porch on the main floor. The upstairs features two private rooms, perfect for a bed/bath or two private bedrooms, your choice! The house comes in at 105 prim impact (mesh), and a 26x32 meter footprint. 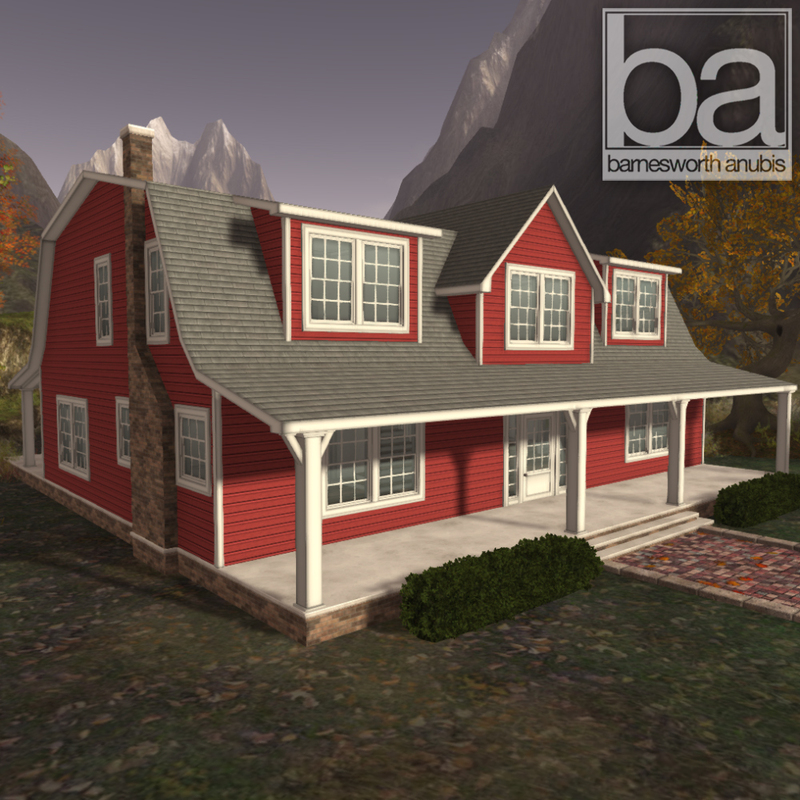 The [ba] bannock cottage will be available at the Collabor88 main store through april 6th at a special reduced cost. After April 6th it will be in the main store and on the marketplace at full price. Also be sure to check out the official Collabor88 March 2017 Catalog with amazing creations by many other designers! New for Collabor88 february 2017 we have the [ba] gansevoort house! This quaint dutch colonial style home features a spacious main floor with plenty of room for living, dining, and whatever else you want. The upstairs features 3 private rooms, perfect for bedrooms and a bath. The home also features a nice front porch, back doors, and an upstairs balcony. The house comes in at 107 prim impact (mesh), and a 16x30 meter footprint. Like most of my other structures it is easy to customize walls and floors inside and outside with tinting or using your own textures! 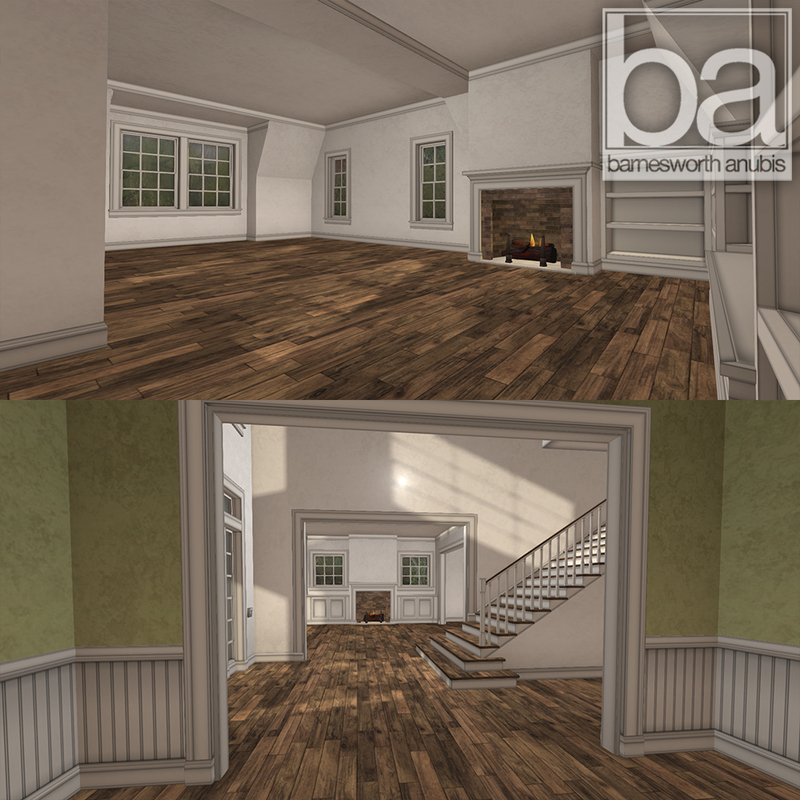 The [ba]gansevoort house will be available at the Collabor88 main store through March 6th at a special reduced cost. After March 6th it will be in the main store and on the marketplace at full price. Also be sure to check out the official Collabor88 February 2017 Catalog with amazing creations by many other designers! Sorry I am behind on blog posts for new releases! catching up now with the January release. 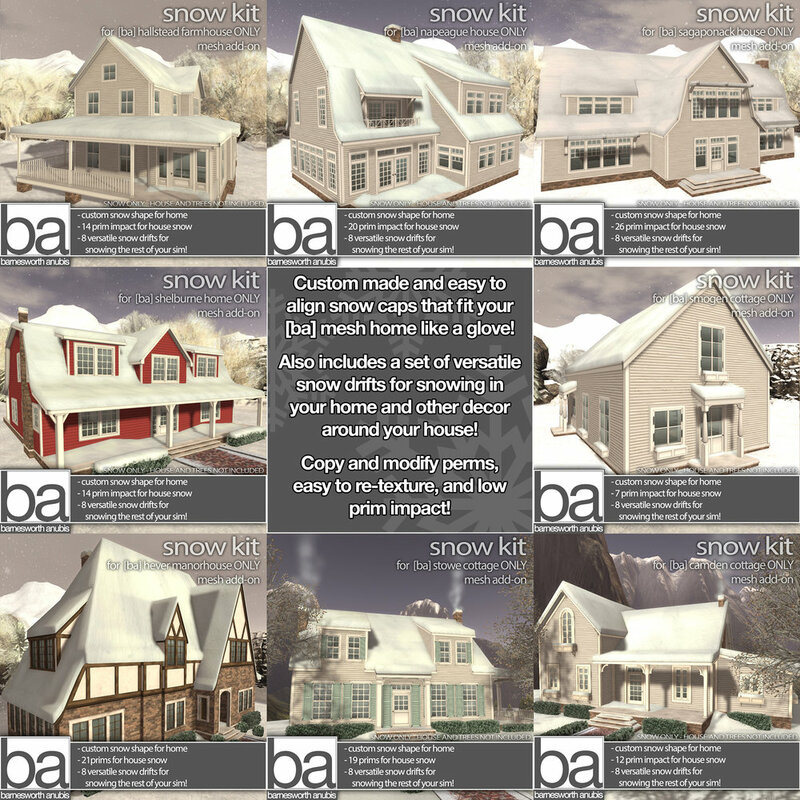 New for Collabor88 january 2017 we have the [ba] hayden house! This picturesque family style home features an elegant and flowing floor plan. The main floor has a foyer, dining room, kitchen, livingroom and den. The upstairs has three bedrooms and a bathroom. The home has ample outdoor spaces with a covered front porch, front and back open terraces with built in planters, and two balconies off the bedrooms. The home features many charming details such as a working fireplace, built in shelves in both the living room and den, and decorative craftsman columns and brackets on the exterior giving it plenty of curb appeal. The [ba] hayden house will be available at the Collabor88 main store through February 6th at a special reduced cost. After February 6th it will be in the main store and on the marketplace at full price. Also be sure to check out the official Collabor88 February 2016 Catalog with amazing creations by many other designers! 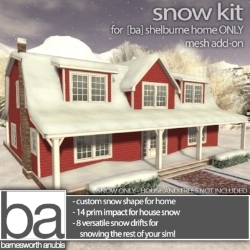 The matching snow cap is also available at a discounted rate for the event if you plan to use this home seasonally. As per tradition for a few years, this weekend following american thanksgiving I am having a big 50% off sale! The sale runs from Thanksgiving to Sunday midnight, and is running in world at the Main Store - be sure to buy from the vendors with the 50% off snow flakes! New for Collabor88 october 2016 we have the [ba] loire chateau! This large french style country home features a grand foyer, formal living room with fireplace, formal dining room, large kitchen, one private room, and a spacious back terrace on the ground floor. Up the grand staircase you will find four more private spacious and light filled rooms. Up another set of stairs you will find a spacious open attic space with one more private room. That is a total of 6 rooms that can be private bedrooms making this perfect for large family style home. The home features many elegant details such as paneling, shutters, and elegant balustrades and balconies. Scripted features include an easy to use central control for access, windows (privacy tinting and open/close), doors, and built in fireplace. The [ba] loire chateau will be available at the Collabor88 main store through November 6th at a special reduced cost. After November 6th it will be in the main store and on the marketplace at full price. Also be sure to check out the official Collabor88 October 2016 Catalog with amazing creations by many other designers! 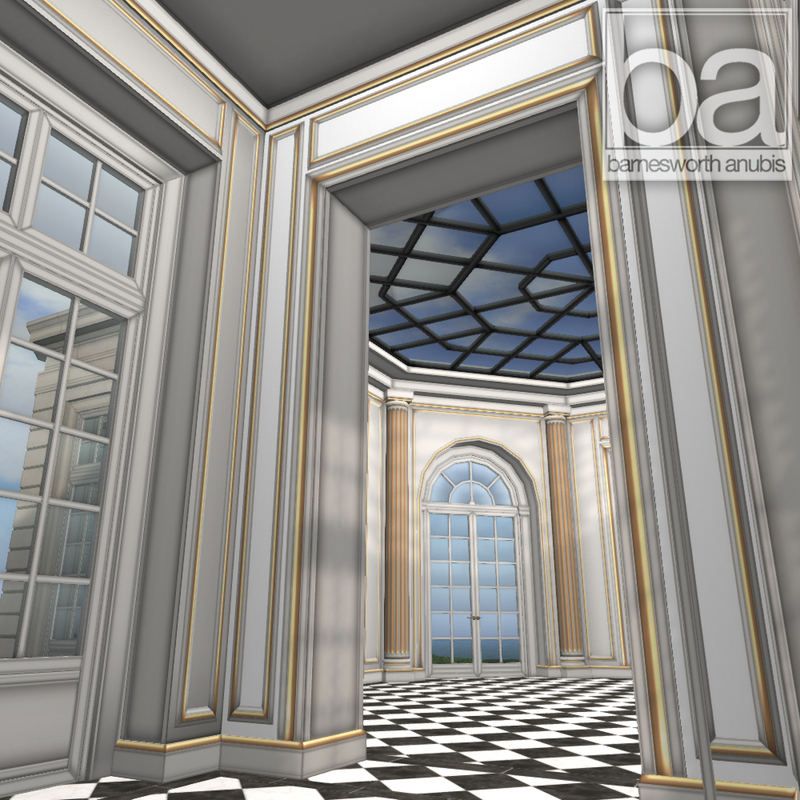 New for Collabor88 august 2016 we have the [ba] versailles pavilion! Inspired by the grand architecture of Versailles. This pre-fab structure is the perfect compliment to gardens, for a special event, or even a peaceful skybox. The pavilion has a round foot print with grand sweeping steps leading up to a central room adorned with elegant columns and arched doorways. Off the central room are four smaller vestibules with french doors leading back out to the cobblestone paved landings. Like most of my other structures it is easy to customize walls and floors inside with tinting or using your own textures! The exterior has more advanced UV mapping but should tint well. 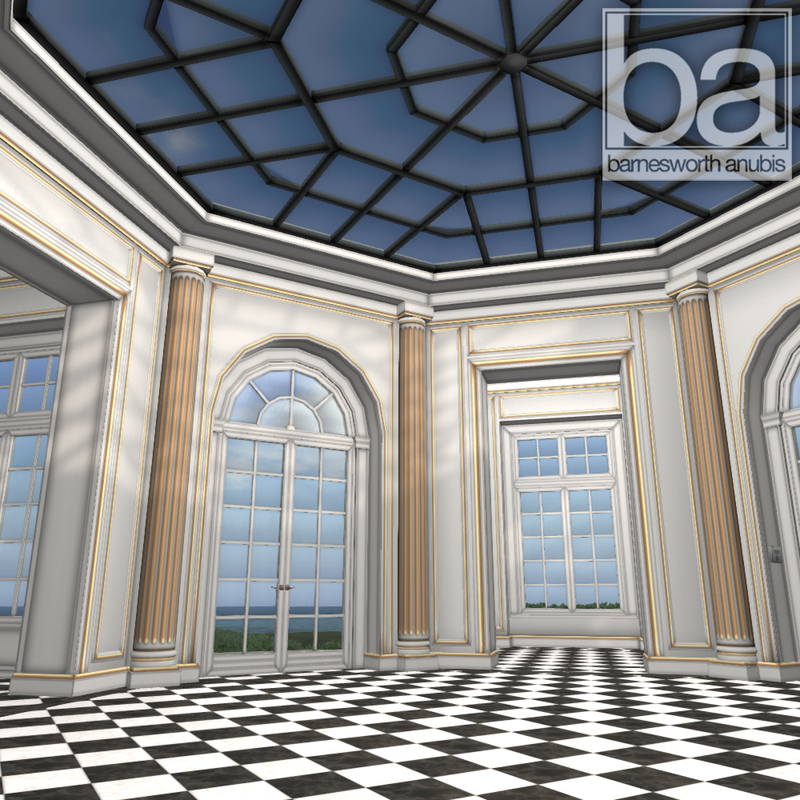 The [ba] versailles pavilion! will be available at the Collabor88 main store through September 6th at a special reduced cost. After September 6th it will be in the main store and on the marketplace at full price. Also be sure to check out the official Collabor88 August 2016 Catalog with amazing creations by many other designers! New for Collabor88 july 2016 we have the [ba] pasadena bungalow! Inspired by cozy craftsman homes of california. This home features a formal living room with fireplace, dining room, kitchen, and foyer on the ground floor. The home features many craftsman details such as brick work fireplace, built in cabinets and decorative columns. The home boasts a generous sized front covered porch and back deck with pergola. The upstairs features three spacious private rooms. The house comes in at 151 prim impact (mesh), and a 35x24 meter footprint. 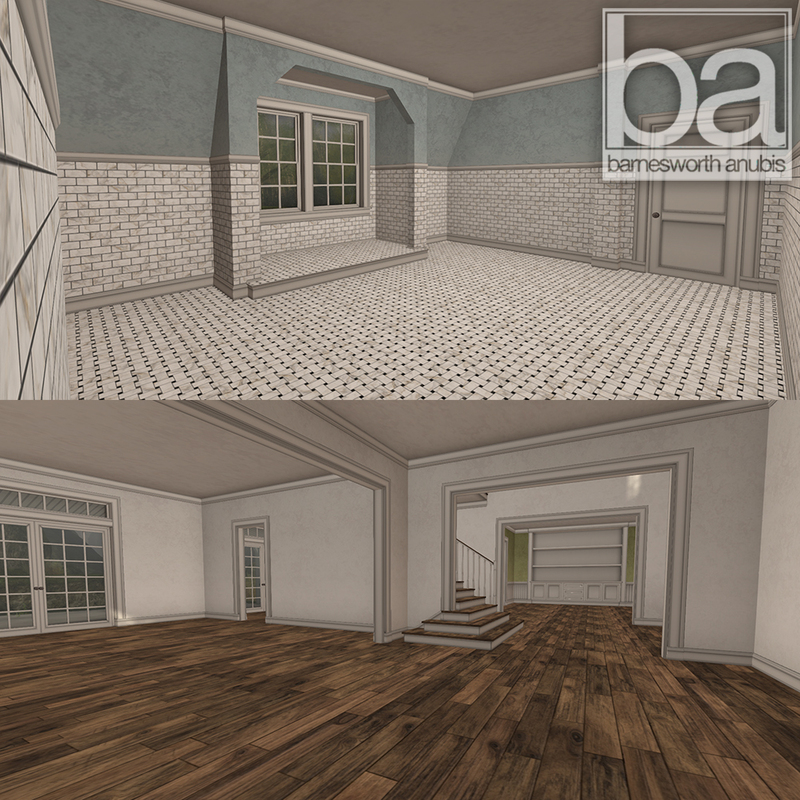 Like most of my other houses it is easy to customize walls and floors with tinting or using your own textures! The [ba] pasadena bungalow! will be available at the Collabor88 main store through August 6th at a special reduced cost. After August 6th it will be in the main store and on the marketplace at full price. Also be sure to check out the official Collabor88 July 2016 Catalog with amazing creations by many other designers! 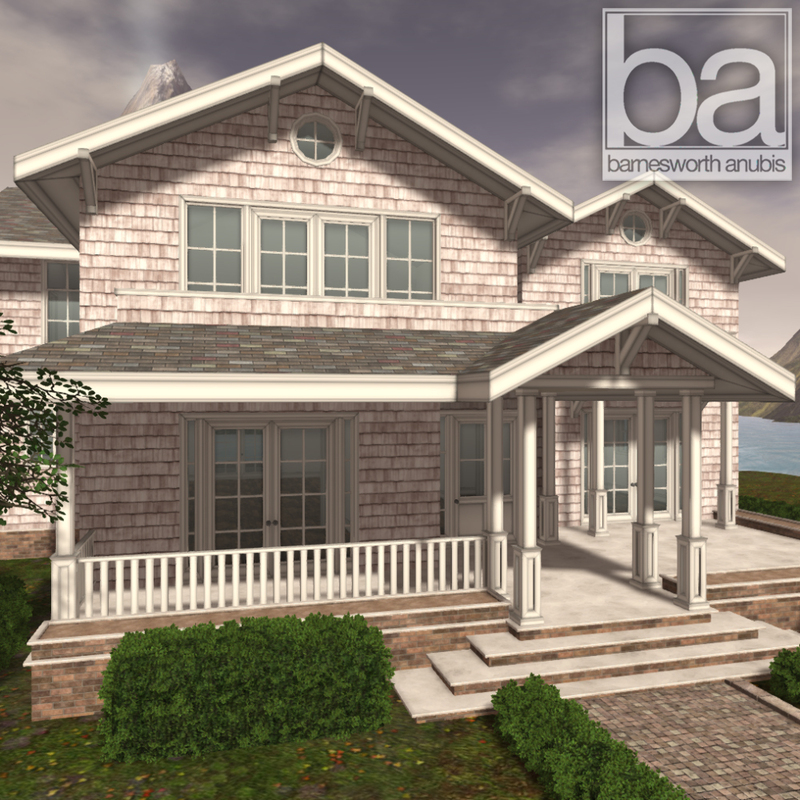 New for Collabor88 june 2016 we have the [ba] henlopen cottage! Styled after a classic new england beach cottage, this two bedroom cottage is perfect for summer. A large porch wraps around the home inviting plenty of outdoor living. The porch has three distinct areas allowing you to make the most of the outside areas. Inside is a spacious living room, a kitchen and casual dining nook. The home features two private rooms and a very generously sized second floor landing. 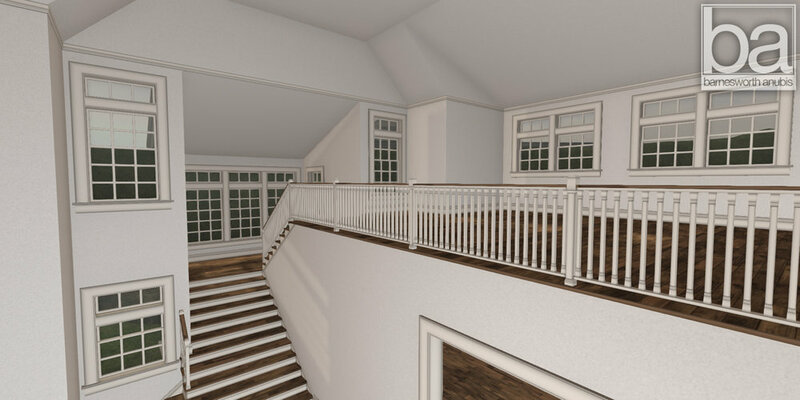 The interior is styled less finished than many of my other homes with exposed planking and framing for a more country/rustic vibe, but white washed for a still elegant feel. The house comes in at 109 prim impact (mesh), and a 32x24 meter footprint. 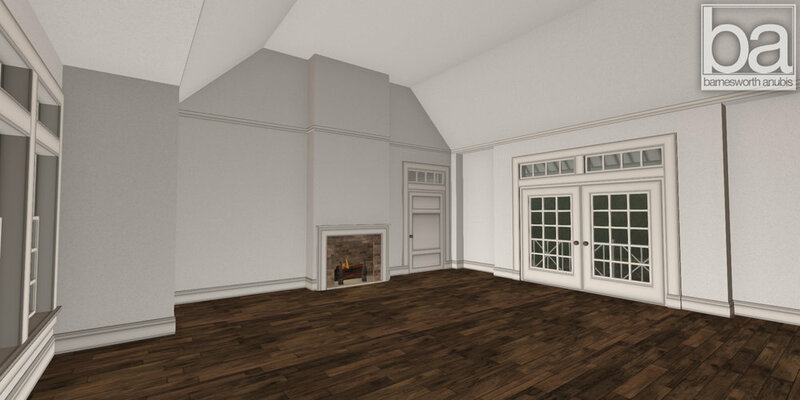 Like most of my other houses it is easy to customize walls and floors with tinting or using your own textures or tints! The [ba] henlopen cottage! will be available at the Collabor88 main store through May 6th at a special reduced cost. After May 6th it will be in the main store and on the marketplace at full price. Also be sure to check out the official Collabor88 June 2016 Catalog with amazing creations by many other designers!